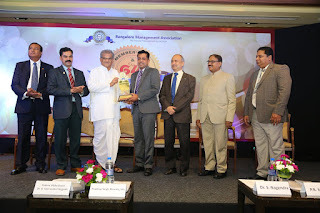 TechnoBind CEO Prashanth G J has won Young Entrepreneur of the Year award from the Bangalore Management Association (BMA) during its Member's day and 64th Anniversary celebration held at Vivanta by Taj, Bangalore.The award is a recognition for a young manager who has made an impact to the society they live in. The award is for someone who shows pride in his profession, innovation and is a role model for youngsters. Prashanth G J has been chosen for his progressive leadership experience in different dimensions of information technology and his contribution to the industry. He started TechnoBind in 2012 and since then the company is profitable with an almost 100% CAGR. Accepting the award, Prashanth G J, CEO of TechnoBind said, "I am honoured to be chosen for the Young Achiever award by the BMA. It's been 5 years since we laid the foundation of TechnoBind and we are constantly growing ever since. We have lived every bit of our tag line - Redefining Possibilities. This award is also a recognition for my dedicated team, partners and our customers, whose constant support inspired us to achieve several milestones." Every year BMA recognizes outstanding personalities of Karnataka who have contributed immensely in their respective field of activity. It recognizes people who make an impact on the life of people. The present membership of the BMA is a strong 400 institutional members and around 2000 individual members. They represent a select band of people and companies/organizations from all disciplines.